Located in Danville, California, Branagh Development Inc. serves the eastern San Francisco Bay area, including the cities of Oakland, Walnut Creek, Lafayette, Pleasanton and beyond. Over the last 32 years, Branagh has emerged as a boutique builder, offering an award-winning approach that combines conscious, concise planning, architecture, top-quality building materials and an expert base of subcontractors. The Branagh Development team prides itself in finding unique development opportunities where other builders might not see the same potential and doing it all in hopes of bettering communities. “We’re a fourth-generation family company with roots in the Bay Area since 1919, back when John Branagh started a small commercial construction company,” says Alex Griffith, chief operating officer of Branagh. In 1986, Peter Branagh started Branagh Development with a mission to build beautiful homes with a personal touch. This is the essence of Branagh Development today and the company’s portfolio now includes multiunit subdivisions, multifamily properties, single-family properties, luxury apartments and a handful of distinct commercial developments. Though Branagh Development’s history is in high-end single family development, Griffith says the company is tackling more multifamily infill projects as of late. “We continue to grow more into the multifamily market and mixed-use properties,” says Alex. The row homes are beautifully finished with walls of glass, Siberian Oak hardwood floors, quartz and marble surfaces and Bosch appliances, and designed with unique spaces, such as a fourth-floor rooftop deck with views. 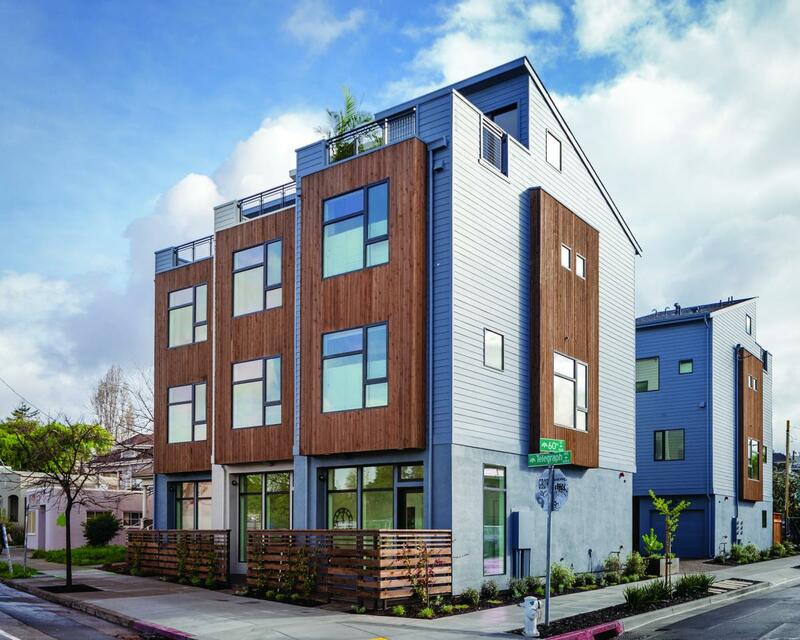 60th & Telegraph highlights Branagh Development’s ability to take something ordinary and make it extraordinary. The nearly 100-year-old home in the heart of Danville was originally a residence, but had been used as a retail storefront for decades. After nearly two years of planning, the town approved a full renovation of the current home for new retail with the addition of a second-story office, a new basement and three luxury townhomes behind the retail space in order to maximize the potential of the lot. Branagh Development’s roots and expertise lie heavily in building custom homes for clients and helping a dream become a reality. With a dedicated project manager and a team approach that is second to none, Branagh Development provides the ultimate experience for custom home clients. “For this particular client, this will be their third Branagh Development home, which speaks to the relationship we establish and the quality of home we deliver,” adds Alex. Other recent custom home projects include a Cape Cod-style home with a spectacular loggia and pool and a chic farmhouse with the ultimate chef’s kitchen and hand-picked stone slabs. Another showcase custom home is a Napa-style residence blending the beauty of the outdoors with the elegance of a custom home. Branagh Development Inc. continues to grow strong roots in the East Bay Area as a fourth-generation builder with an eye for turning ordinary properties into extraordinary value-added developments.